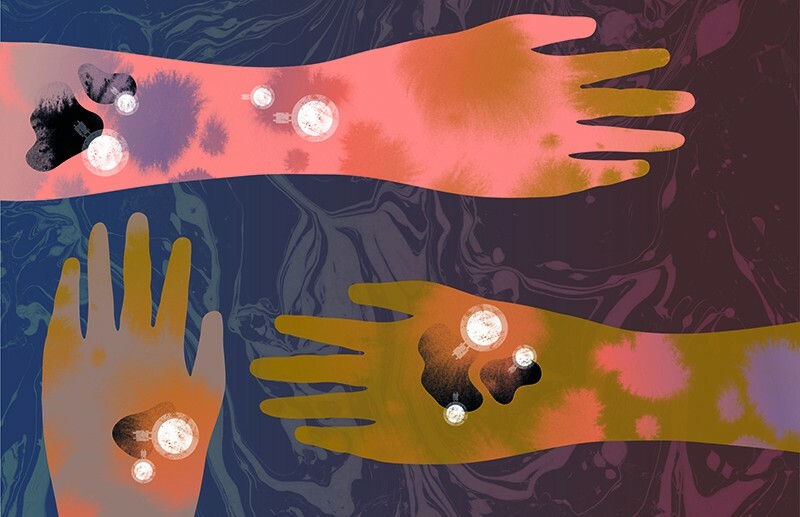 Personalized vaccines and viruses that infect and destroy cancer cells can help the immune system to build up a strong and specific attack against skin cancers. Melanoma cells typically carry many mutations, which results in the production of altered proteins not present in healthy cells. Vaccines against such tumour-specific proteins stimulate the immune system to target and destroy the malignant cells. Patrick Ott at the Dana-Farber Cancer Institute in Boston, Massachusetts, and his colleagues created personalized vaccines that each included 20 altered peptides present in tumours of individuals at high risk of melanoma recurrence. Of six people vaccinated, four remained free of tumours 25 months later. The cancer recurred in the remaining two, but completely regressed after therapy with PD-1 inhibitors — antibodies to the cell-surface protein programmed cell death protein 1 (PD-1) that block the damping down of immune responses and so prevent cancer cells from avoiding destruction. Ugur Sahin at BioNTech in Mainz, Germany, and his collaborators vaccinated 13 people with RNA molecules encoding up to 10 peptides specific to their individual melanomas. After 12–23 months, 8 individuals were cancer-free. In two other patients, tumours regressed after vaccination, and in one more patient, after vaccination and treatment with a PD-1 inhibitor. Antoni Ribas at the University of California, Los Angeles, and an international team treated 21 patients who had advanced melanoma with injections of an oncolytic virus into the tumour, followed by combined therapy with a PD-1 inhibitor. The virus attracted immune cells to the tumour, and the inhibition of PD-1 boosted immune activity throughout the body. Patients tolerated and responded well to the therapy, with an overall response rate of 62%. PD-1 inhibitors can treat all types of cancer, regardless of tumour site — especially if the cancer cells cannot repair damaged DNA. Cells that are mismatch-repair (MMR)-deficient have high rates of mutation, which leads to the formation of many altered proteins. This makes MMR-deficient cancer cells easier for the immune system to recognize and destroy than cells that can repair their DNA. Only a small proportion of tumours — 5% of colorectal tumours, for example — have MMR deficiency, but this subset seems to be particularly sensitive to this type of immunotherapy. In the CheckMate 142 phase II trial, funded by Bristol-Myers Squibb, 74 patients with metastatic MMR-deficient colorectal cancer who had been treated previously in other ways received the antibody nivolumab, a PD-1 inhibitor. Michael Overman at the University of Texas MD Anderson Cancer Center in Houston and an international team reported that 69% of patients had their disease controlled for at least 12 weeks. Luis Diaz Jr at Johns Hopkins Hospital, Baltimore, Maryland (now at Memorial Sloan Kettering Cancer Center in New York City), and his colleagues gave the PD-1 inhibitor pembrolizumab to 86 people with 12 different MMR-deficient solid tumour types. Fifty-three per cent of patients responded to therapy; tumours regressed completely in 21%. The trial was funded by the non-profit organization Swim Across America and by Merck, among others. On the basis of these findings, the US Food and Drug Administration (FDA) has approved second-line nivolumab therapy for MMR-deficient colorectal cancer, and second-line pembrolizumab therapy for MMR-deficient tumours regardless of tumour site — the first time such a tissue-agnostic approval has been made. For patients with advanced or metastatic cancer of the bladder or of other parts of the urinary system, chemotherapy with cisplatin is standard. When this stops being effective, patients receive other forms of chemotherapy, but generally do not survive beyond another 6–7 months. Immunotherapy is seen as challenging the status quo. The outcomes of non-randomized phase II trials led the FDA to approve the anti-PD-L1 antibody atezolizumab (in 2016) and the PD-1 inhibitor nivolumab (in 2017) as second-line therapies for urothelial cancer. Keynote 045, a Merck-funded trial involving 542 patients, was a randomized phase III trial of the PD-1-inhibitor pembrolizumab as a second-line therapy. Joaquim Bellmunt at the Dana-Farber Cancer Institute in Boston, Massachusetts, and an international team found that patients treated with the antibody survived about 3 months longer and experienced fewer adverse effects than patients receiving chemotherapy alone. Many patients with urothelial cancer cannot receive cisplatin because of severe disability, poor kidney function or other diseases. Phase II trials are investigating immunotherapy as a first-line approach for such patients. In two separate trials, Arjun Balar at New York University and international teams investigated atezolizumab and pembrolizumab as first-line therapies. In IMvigor210, funded by Hoffmann-LaRoche and Genentech, 119 people with advanced or metastatic urothelial cancer were treated with atezolizumab, whereas in Keynote 052, funded by Merck, 370 patients received pembrolizumab. In both trials, patients responded to treatment and the drugs were well tolerated. In 2017, the FDA approved atezolizumab as a first-line agent, and pembrolizumab as a first-line and second-line agent, against advanced urothelial cancer. Findings from recent phase III clinical trials could lead to a greater role for immunotherapy in the treatment of advanced non-small-cell lung cancer (NSCLC). PD-1 inhibitors such as pembrolizumab and nivolumab have been approved as second-line therapies for advanced NSCLC, and are now being investigated in patients who have never received chemotherapy. In the Keynote 024 trial, funded by Merck, Martin Reck at the German Center for Lung Research, Grosshansdorf and his colleagues randomly assigned 305 patients with untreated advanced NSCLC to receive pembrolizumab or platinum-based chemotherapy. Patients expressed PD-L1, a cell-surface protein that PD-1 recognizes and binds to, in at least 50% of their tumour cells. Patients taking pembrolizumab survived without cancer progression for significantly longer — a median of 10.3 months versus 6 months — than those receiving chemotherapy. They also had longer overall survival and fewer adverse effects. These encouraging findings contrast with the results of the CheckMate 026 trial, funded by Bristol-Myers Squibb. A group led by David Carbone at Ohio State University in Columbus compared nivolumab and platinum-based chemotherapy in patients with advanced or recurrent NSCLC. Despite being less toxic than chemotherapy, nivolumab did not improve progression-free survival. Anti-PD-L1 antibodies have also been investigated as second-line agents against advanced NSCLC. In the OAK trial, funded by Hoffman LaRoche and Genetech, David Gandara at the University of California Davis Comprehensive Cancer Center, Sacramento, and his colleagues compared the anti-PD-L1 antibody atezolizumab and the chemotherapy drug docetaxel in 850 patients with advanced NSCLC who had already undergone platinum-based chemotherapy. Atezolizumab significantly improved median overall survival — 13.8 months versus 9.6 months with docetaxel. Patients with advanced, non-metastatic NSCLC who are not eligible for surgery are typically treated with a combination of conventional chemotherapy and radiation. Results are poor: the likelihood of cure is only about 15%. In the Pacific trial, funded by AstraZeneca, Scott Antonia at the Moffitt Cancer Center in Tampa, Florida, and his colleagues gave the anti-PD-L1 antibody durvalumab to 709 patients who had received standard chemoradiotherapy. Median progression-free survival was 16.8 months in the durvalumab group and 5.6 months in the placebo group, a significant difference. The kinase inhibitors sorafenib and regorafenib were until recently the only molecular therapies available for advanced hepatocellular carcinoma (HCC), the most common form of liver cancer. Immunotherapy is now also emerging as a strategy against the disease. The CheckMate 040 phase I/II trial, funded by Bristol-Myers Squib, tested the anti-PD-1 antibody nivolumab in patients with advanced HCC, 76% of whom had received previous treatment, mostly with sorafenib. An international team of researchers assessed the responses of 48 patients to increasing doses of nivolumab, and then treated another 214 people with a fixed dose of the drug. The objective response rate, a measure of tumour response to therapy, was 15% in the first phase and 20% in the second — higher than in previous trials of sorafenib (2–3%) and regorafenib (7%). In the first phase, overall survival was 15 months, compared with less than 11 months in trials of first-line sorafenib therapy. In September 2017, the FDA approved nivolumab as second-line therapy for advanced HCC. A phase III randomized trial comparing nivolumab and sorafenib in advanced HCC is expected to be completed in October 2018. 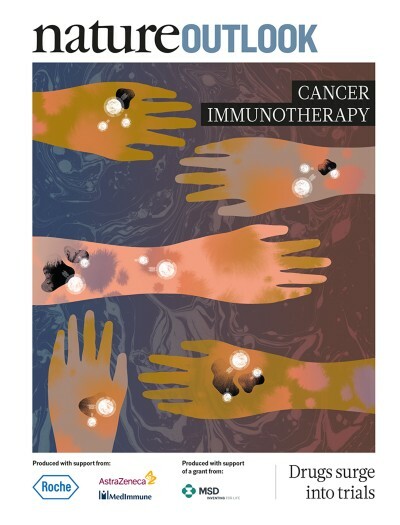 This article is part of Nature Outlook: Cancer immunotherapy, an editorially independent supplement produced with the financial support of third parties. About this content.